The aerial image on the left shows Hatteras Island in North Carolina taken before Hurricane Irene (Credit: Google Earth). On the right, the post storm image shows the largest breach of Highway 12, which runs along the Outer Banks. 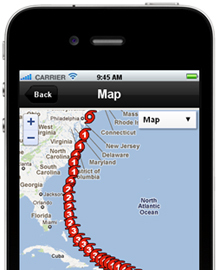 Image of the new mobile application developed by NOAA's National Geodetic Survey. NOAA's National Geodetic Survey recently released a prototype mobile web application that makes it possible for emergency responders to access emergency response imagery while in the field. The prototype uses imagery acquired by NOAA aircraft following Hurricane Irene. NOAA collected more than 1,500 images the first day of the storm to assist with assessing storm damage. The prototype also includes imagery collected following the May 22 tornado in Joplin, Missouri. The application can be viewed on iOS, Android, and Blackberry smartphones and tablets. The web application may be viewed using Google Chrome, Apple Safari, and other WebKit-based browsers. It is not viewable on Microsoft Internet Explorer or Mozilla Firefox.